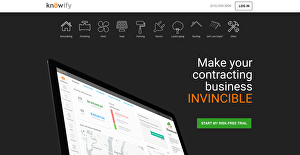 Knowify is a popular mobile contractor management software that is designed to help contracting professionals in small-medium contracting business streamline workflow. This platform’s capability is impressive, as it can address both the real-time and complex needs of contractors and at the same time satisfy the requirements of all office staffs including the accountant. With Knowify, it becomes easier for all contractors to track time, check work orders, and submit expenses from the mobile device and sync all data in real-time. If you are looking for the most convenient software for scheduling, purchasing, change orders, and managing projects, invoices, contracts, and more electronically, do not look any further. Knowify presents the best way to run your business efficiently with deeper insight on performance. Knowify has powerful project management and built-in job costing features that will enable you to track the performance of your business and make accurate job estimates. These features make it easier to monitor real-time project progress against materials and labor budget without any additional data entry. Proper bidding is core ingredient to any successful contracting business. This platform appreciates this fact and is built with the right features to help you bid for commercial GC jobs and other jobs with property owners. Once your bids succeed you will have the freedom to capture the clients’ acceptance thanks to the Knowify e-signature feature. In addition, the built-in change order makes it easier to send out the change orders for the acceptance. These features are protagonist and enable you to work from wherever you are. With the automated invoicing feature, Knowify has all your billing covered. Whether you bill using the AIA-style or the standard invoices you have nothing to worry about. It’s a breeze to prepare all the invoices since the software integrates the automated invoicing feature with the change orders, contracts, purchasing, and timekeeping. Moreover, this platform ensures your office has the control and visibility over timekeeping at all time. Each team member has the convenience of tracking time from a mobile device or computer. Whether you want the foreman to enter time from the site, maintain manual timecards, or each member to use the use the GPS-verified time track, Knowify has covered all that. If you are considering Knowify it might also be sensible to check out other subcategories of Best Construction Management Software collected in our base of SaaS software reviews. Every company has different needs and requires a system that can be personalized for their size, type of staff members and customers, and the particular industry they are in. For these reasons, no software can proffer perfect tools out-of-the-box. When you try to find a software system, first be sure what you need it for. Read some Knowify reviews and ask yourself do you desire basic features or do you require sophisticated tools? Are there any industry-specific features that you are searching for? Obtain the answers to these questions to assist your search. There are multiple factors that you need to reflect on and these include your finances, particular business needs, your company size, integration needs etc. Take your time, try out a few free trials, and finally zero in on the platform that offers all that you require to boost your company competence and productivity. How Much Does Knowify Cost? We realize that when you make a decision to buy Construction Management Software it’s important not only to see how experts evaluate it in their reviews, but also to find out if the real people and companies that buy it are actually satisfied with the product. That’s why we’ve created our behavior-based Customer Satisfaction Algorithm™ that gathers customer reviews, comments and Knowify reviews across a wide range of social media sites. The data is then presented in an easy to digest form showing how many people had positive and negative experience with Knowify. With that information at hand you should be equipped to make an informed buying decision that you won’t regret. What are Knowify pricing details? What integrations are available for Knowify? If you need more information about Knowify or you simply have a question let us know what you need and we’ll forward your request directly to the vendor.